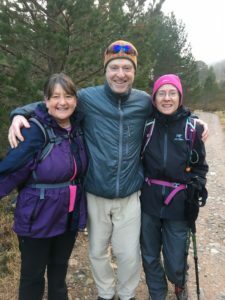 Fiona, Gavin, and Carol (right to left) were walking by Tyvoan bothy when I met them. Gavin asked me about America’s new president, and we have a good conversation before they traveled on. I’ve met a lot of people from all over the world in just a few days at hostels, on trains and buses, and even in the middle of the woods. On the day I reached Tyvoan bothy, I met Gavin, Carol, and Fiona as I was looking for firewood. They gave me advice about how to find more bothies and suggested that I visit Skye and the western coast of Scotland. The next morning, when I was certain that I was totally alone, I looked out over the heath below and saw a man plunging through peat and grass like it was nothing. I was freezing. His shirt sleeves were rolled back. 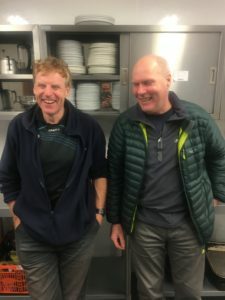 When he arrived at the bothy, he informed me that his name was Dez and that he had just finished wild camping for 8 days. Just as quickly as he arrived, Dez disappeared over a hill. There was Andrew from Vancouver, Ian from Fife, Nick from Derbyshire, and a lovely old lady who had a farm between Aviemore and Glenmore. There’s always the “So” too. They want to know and ask an American about the madness that was our past election, but they enter the subject timidly–like they are stepping into a political minefield. In the Aviemore hostel, I spent a good hour talking with Dave and John, who are a hilarious pair of mates. But even amid the joking and laughing, we eventually had to mention the big haired elephant in the room. Having been designated as the voice of America, I have answered everyone as honestly as I can. So, what have I said? Dave (left) and John (right) were absolutely delightful. They were interested to hear about American politics, which I was glad to discuss, but what I enjoyed the most was their good-spirited joking. I said that I have friends and relatives who voted for Mr. Trump, and I have friends and relatives who didn’t. I know people who are certain that the apocalypse is coming and others who believe that positive change is in the wind. I told them that, based on all that I have seen of Mr. Trump, that I don’t think he will be happy as president. Just because you’re president doesn’t mean you can do whatever you want. I think that’s a direct quote from The Lion King. I don’t think the Republican congress will rubber stamp everything he wants and that we might be in for some interesting fights in the future. I just want everyone in the US to know that the rest of the world is watching, perhaps with some apprehension and certainly with fascination. So, why mention this in a blog about kindness? I believe that political discourse, which is absolutely essential in any free society, can be one of the most divisive forms of discussion. That is why it is essential for people, no matter where they’re from or what they believe, to be able to sit down together and discuss their views about what matters to them as citizens. Real political discourse is as much about listening as it is about speaking, though. It requires kindness and compassion and empathy. My hope, no matter who holds the office, is that the person leading our country will think about America and all of her people and that the decisions that are made lead to more positive results than not. So, in that spirit, I can only wish President Trump well.